Now comes the exciting part of deciding what kind of cake you want. Flavour wise, there’s plenty of options from salted caramel to chocolate fudge to red velvet to a classic Victoria sponge. The good news is in a tiered cake, you can have a combo of flavours so no need for argument or missing out on your favourite. Design wise, the cake world is your oyster. Each week we make all sorts of weird and wonderful creations from traditional tiered white numbers to themed wedding cakes depicting the interests of the bride and groom. No design is ever the same and we love that! Shades of white, ivory or cream. Whatever you call it, these types of the more traditional coloured cake designs with or without piping and sugar flowers will always be popular. 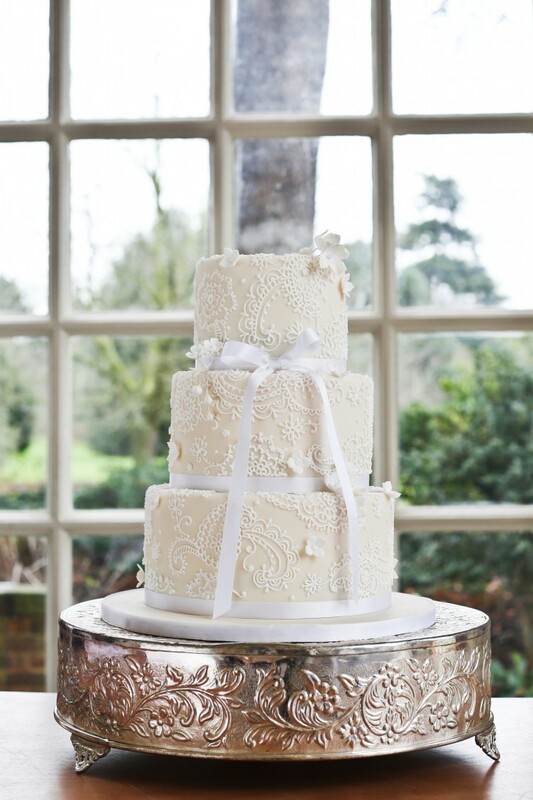 Transposing elements from a stunning lace dress onto the cake or wedding invitation detail will tie the cake into other elements of the day or adorn with beautiful fresh flowers matching your bouquet. Stunning! Peacock blue, cerise pink, lime green. 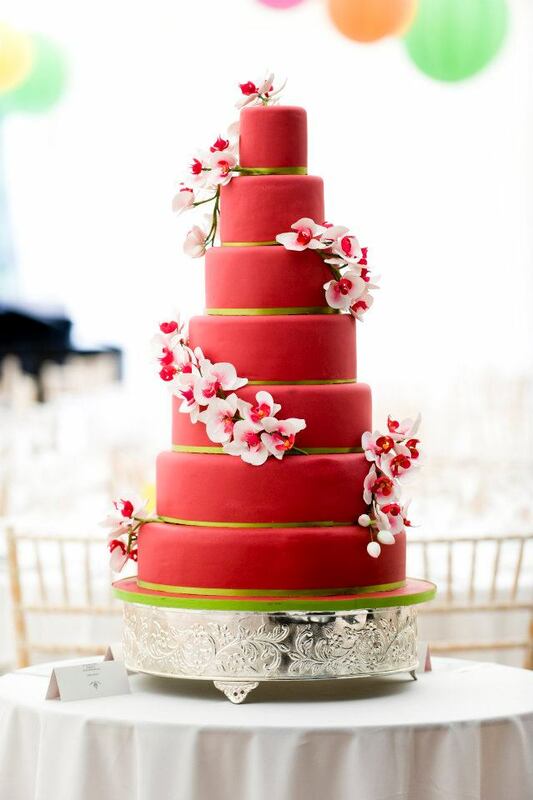 There are no rules when it comes to what colour your wedding cake should be and given the cost involved in all things wedding, you may as well make each element as memorable as possible. Two examples of brightly coloured cakes show how they can look very different depending on how they are styled. 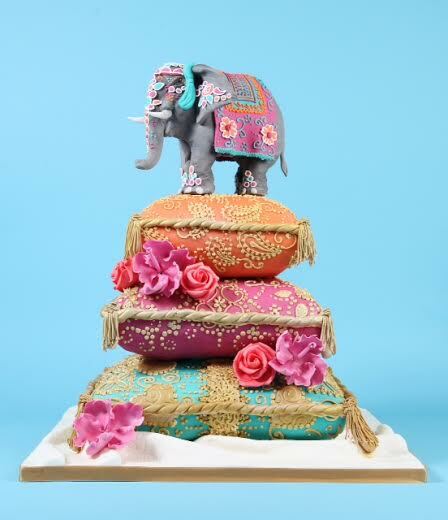 The first example with sugar orchids winding their way down the cake is a bit more of a traditional take while the Indian Elephant cushion cake is more of a funky option and has proved to be very popular over the last year. Now novelty cakes are a little bit like Marmite especially when it comes to novelty wedding cakes. Back in the day, a novelty wedding cake almost certainly included a rather tacky plastic bride and groom on top of the cake and some sort of depiction of their interests running through the tiers. 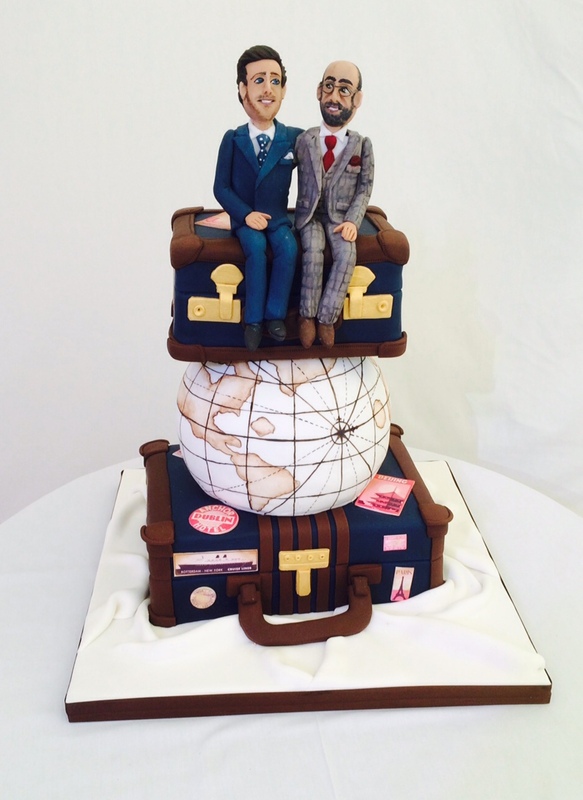 Luckily things have evolved and we are now being asked for all manner of weird and wonderful things from the stunning travel themed wedding cake featured to sugar model PG Tips bride and groom monkeys because that is what the couple collected. It is these cakes that really give an insight into the couple and their personality and which presumably are a real talking point on the big day. No fondant allowed on these beauties and rightly so. The amount of design is somewhat limited by the fact that the outer covering of the cake is buttercream however the fact that it looks so delicious means a few fresh flowers or some berries are really all it needs. 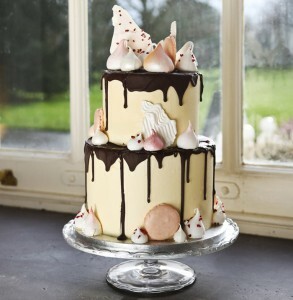 The buttercream can also be coloured and adorned with drippy chocolate and then piled with anything you fancy as a more contemporary take on the buttercream cake. Yummy! 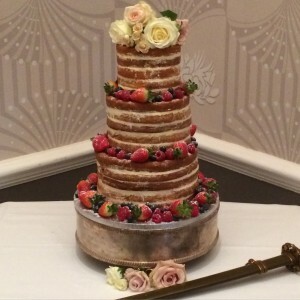 Naked cakes have been around for a few years and they are still proving a very popular choice for all sorts of weddings not just rustic summer ones. Simply dressed with flowers or fresh fruit or a combination of the two, the naked cake looks here to stay. 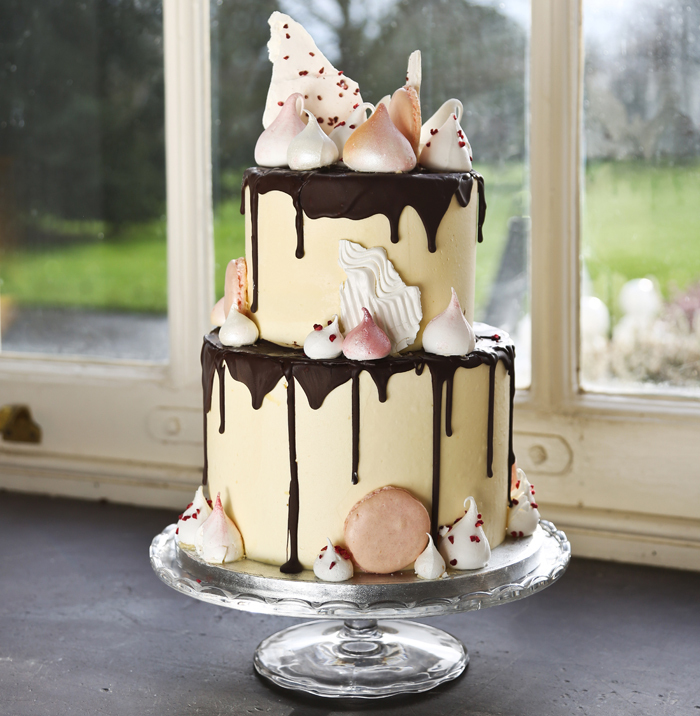 However it’s relative, the more prudish semi-naked cake is chasing hard in the popularity stakes. 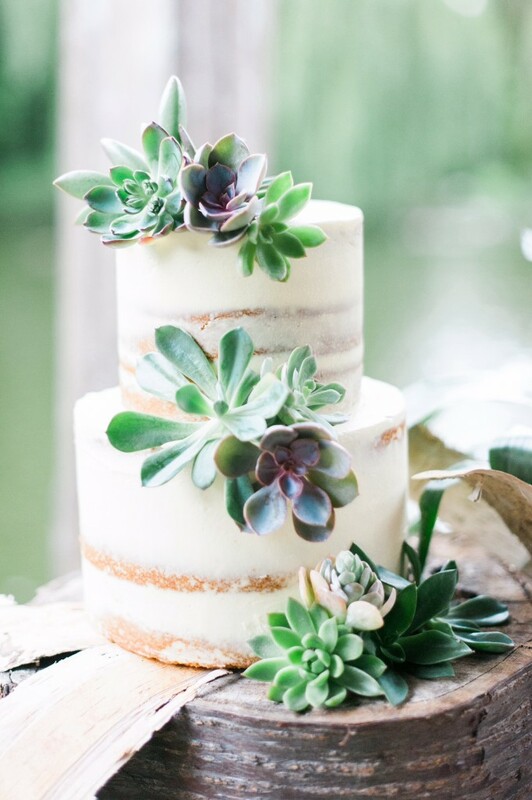 We prefer this as a cake choice as it still looks rustic and appealing to eat however the skim of buttercream keeps the cake moist and perfect to eat and is a slightly more chic look for the naked type cake this season. The choice is yours! We look forward to hearing from you and chatting about what you have in mind.